Mohun Bagan edged past Calcutta Customs with a clinical 2-0 victory to claim their first Calcutta Football League title in 8 years. The stands were packed to the brim even though it was a weekday; everyone who came to cheer for their favourite club went back with happy faces. 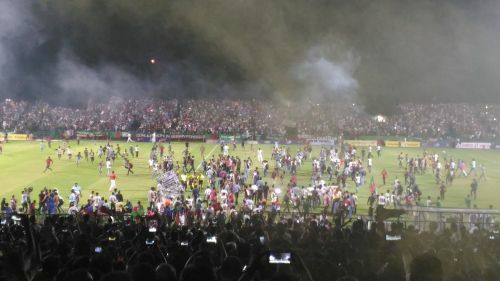 Fireworks were lit everywhere inside the ground, sky lanterns were lit and the green and maroon flag was waving high, it was a carnival-like atmosphere at the ‘Maidan’ based club ground! Coach Shankarlal Chakraborty, the mastermind behind Mohun Bagan’s success, was prompt to dedicate the win to his wife, former coach Sanjoy Sen and also current East Bengal Technical Director Subhash Bhowmick under whom he started his coaching career. During the post-match press conference, he was asked whom he wanted to dedicate this win to. He replied, “My wife, Subhash (Bhowmick) Da, and also Sanjoy (Sen) Da who guided me.” It was under Subhash Bhowmick’s reign at Mohun Bagan that Shankarlal started his career as an assistant coach. Much has been spoken about the battle between the creator and the creation, but at the end, Shankar had the last laugh. Henry Kisekka’s fine finish with a powerful left-footer gave Bagan the lead in the 4th minute itself. The green and maroon brigade dictated terms for almost the entire first half and netted the second in the 45th minute. Dipanda Dicka, who missed numerous chances to score in the first half, produced a perfect cross to his compatriot Henry which was converted by the striker to double the lead. Calcutta Customs created a few nervous moments for Mohun Bagan in the second half but the hosts managed to keep them at bay. In the 59th minute, Dicka missed a sitter in front of the goal following Azharuddin's header which came back after it had hit the woodwork. The win was enough for Shankarlal’s team. It has been a successful campaign for them and they have been crowned champions with a game left!